As the mother of two young kids, I cannot say enough good things about LeapFrog products. We have purchased several LeapFrog items in the past 5 years, and they are always a hit. This year the hot new item on many Christmas lists will likely be the new LeapFrog Leapster Explorer. The Leapster Explorer boasts a larger screen than previous versions of the Leapster, and the graphics are amazing! In addition to games, you can also download learning apps (games, e-Books, videos and flash cards). A camera/video recorder for your Leapster Explorer is available for purchase as well (my daughter will LOVE this). As always, LeapFrog offers a wide variety of games for the Leapster Explorer – everything from Toy Story 3, to Dora the Explorer to Star Wars. One of the best things about these games (in my opinion) is that they are not only entertaining – they are educational. Kids can learn school skills such as math, reading, science and geography as well as problem solving skills and more. 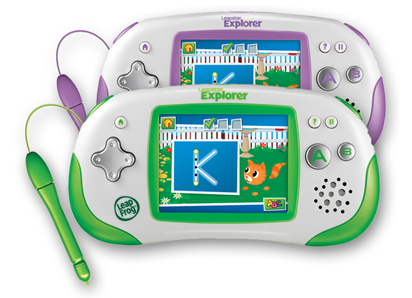 The Leapster Explorer is targeted to kids ages 4-9, and retails around the $60 mark. Games run anywhere from $15-20 each. Personally, I feel this is a great value for the money because it will grow with my child. I think it will be perfect for long car rides, sitting in the waiting room at the doctor/dentist and more. I am super excited to put this under the tree for my 4 year old this year, and I’m even more excited because I get to give a LeapFrog Leapster Explorer Prize Pack away to one of you! 1 winner will receive a LeapFrog Leapster Explorer, Games & Accessories valued at approximately $250! This giveaway was sponsored by LeapFrog as part of the Win Giveaways 2010 Holiday Giveaway Bash. This post was written by me and was not edited by the sponsor. Read more in my disclosure policy. Find more information on the terms for this giveaway on the Win Giveaways Facebook page. I want to win one because it’s a fun and education toy that will be a big hit here! It would be the best christmas present for my 3 year old son. If I win, I am giving it to a 5 year old boy here in West Columbia. His father is having bypass surgery this Wednesday and will be out of work through the holiday season. Funds are tight with this family so our family is assisting as much as possible with Christmas. I would LOVE to win this! I have a Kindergartener and a child in Pre K and one coming up right behid them. This would be great for them all to play and learn with! As a mother of 7 with 3 boys under 5, a Leapster would make my time in the car both educational and fun for my boys! Since they have 3 sisters in ballet and 1 brother in baseball (not to mention art, music & scouts) they spend a lot of time in the car waiting and watching. This would be such a blessing! I would like to win the Leapster to present to my niece as a Christmas gift this year. I would love to win this for my daughter. She loves video games, but this has many educational games available. I would like to win these for my kids. Both are special needs and this is something that would help them with their many issues. my son loves to play with his older brother’s older leapster and we want to give him one of his own for christmas. we are short on money this year so the only way would be to win one :) i’ll be keeping my fingers crossed!! I have two children ages 2 and 9 months so this would get great use at our home! My 4 year old would LOVE this!!! What a great Christmas present! My son and daughter would really benefit from this! They both have problems writing their letters. My son is 12 and my daughter is 7. I follow you on facebook and changed my status for this giveaway. Would love to add to my Leapster collection for my 7 year old. She would be thrilled to get this as a Christmas Present and I would be thrilled to get this for her as times are hard for everyone this year and it would be a great suprise!!!! All 3 of my kids would love this! I want to win this and give it to my son for Christmas. I have been researching 3 different educational handheld toys and this is one of them. I want to win this for my daugther. She has been wanting one for a while and I just haven’t been able to afford it yet. Our family has been looking for ways to give at Christmas and this would make a nice gift for a needy child. This would be great to win . My son has always wanted one. Such a great gift all my kids could use. I would love to win the leapster because my husband is getting laid off in December and funds are going to be really tight this year for Christmas for my three boys! My younger two would love this for Christmas! Thanks for offering this!! I’d LOVE to win this for my son!!!! My niece would LOVE this for a holiday gift! Would love to have this for my little guys. They would freak! My 4-year-old daughter would love to have the Leapster Explorer. She is very interested in learning new things daily. I want to win an Explorer, becuase it would be a perfect Christmas gift for my 3yr old! He would spend hours learning new things and playing games! My daughter LOVES her leapster, so we are in the market for a Leapster Explorer. My husband calls her Leapster, her Pre-K Crack because she is so addicted to it. I follow you on Facebook and have subscribed to your feed. Thank you for all you do! I have a two year old and almost 4 year old (December 8). We don’t have much money for Christmas this year, so this would be a very welcome addition under the tree. I’m a current feed subscriber. I like you on fb and have shared this with my friends! I would love to win for my nephew! I promoted this on my FB page! I would love to win this. My daughter wants to play with it every time we go in Target or Toys R Us. I would like to win this Leapster prize pack because we just left our Leapster on an airplane and it hasn’t been turned it :( It is pretty much the last thing we pack whenever we are headed out in the car for any kind of traveling–and we will be lost without it! I hope these will be easier to get our hands on than the year the first Leapster came out! Thanks for all you do! I tweeted about the awesome giveaway! I would love to win this because my sons have so much fun with all the Leapster products. Having the latest one would be great! I get your e-mail newsletter! I signed up for your emails too! I want to win this for my five year old! Would love to win one of these for my son. We have an original Leapster that’s been passed down and well loved. we would love an updated version! I would like to win this for my daughter because I think she would really enjoy this toy, plus I’m pleased with the educational component. Leapfrog taught my son to read at age 3. He is now 8 and in second grade and is reading The Lord of the Rings this week. He is an amazing reader! I would love to have one of these for my younger daughter, who us just starting to recognize letters and understand phonics. My little guy loves all leapster products and I would love to win this for him! I would love to win this for my daughter, she just turned 3 but she keeps asking that Santa bring her a video game for christmas. I would love to win this for my daughters. i have 3 little girls and i plan on getting them all one of these. So winning one would be great! I provide daycare in my home. some of the kids cannot afford toys like this so I would love to have one here that they could play with. This would be a great gift for my youngest who’s entering kindergarten. I would LOVE to win the leapster for my son! He has seen the commercials for it and is so excited when they come on! I have 8 grandchildren under 9 yrs old so this would be great when they visit. I would love to win this for my daughter! She turns 4 very soon and I love educational toys. I have 3 kids, and I think leapfrog products are great. We have the tag jr, leapster, leapster 2 and are looking forward to having a leapster explorer! Thanks for offering this contest. Great website. I am happy to participate. I would love to in because my son is asking santa for the Leapster Explorer this year. I would love this for my five year old son. :) His friend has an older model and he already knows how to play it. What a great giveaway! I want to win because I love leapster products. Very educational! Thanks. Signed up for your email newsletter! I want to win this for my baby girl; it would come in handy on long trips moving military bases. I would love to win one because I have three boys and they all fight over the oldest ones leap frog. They only have one game. but would love to add to the collection. Would love to get this fun and educational toy for my niece…and then it can be passed along to my daughter in the future. I would love to win because my 3 and 4 year old would LOVE it!!! I would love to win this because this is what my 4 year is asking Santa for this year. It would be great to be able to have it under the tree on Christmas morning. I would love to win one of thes for my daughter! I love educational toys! Thanks for doing this….so exciting! My son would love to win this for my son!!! I’m a follower on FB. Would love this for my nephew who is autistic. I would love to win this for my almost 4 year old. He has the original Leapster, and I would love to update it. The games are very educational while being fun for him at the same time. My almost 4yr old daughter would love this leap frog explorer!! Maybe I will win it! I retweeted this on Twitter. Thanks for a chance to win! I have been shopping around looking at handheld games and would be wonderful to win one!! Promoted this giveaway on FB. I would love to win this for my daughter. Funds are low since I lost my job and this would make a great present.. Thanks for a chance at winning. This would be a great Christmas gift for my 2 1/2 year old daughter. My son would love this.. and hopefully he would share with his brother later! I love that it is educational… so helpful! I’d love to win this to give to my 6 year old son for Christmas. He is struggling with learning his letters in Kindergarten. This would be a Blessing to my family. I want to win because this is on my daughter’s wish list. i would love to have this for kids. It’s both educational and fun! My 4 y.o. grandson loves Leap Frog products…I would be his “favorite” if I win! Would love to win this for my 3 year old! Thanks for the giveaways and fun! I would love to win a LeapFrog Leapster Explorer! My son goes crazy when he sees this in walmart because he plays video games at home and this one is more his age plus he soaks up everything like a sponge so this would be awesome for him! This would be a great present for my 4 year old. I have four children and Christmas is getting harder and harder. I do believe this is the most I have ever been behind in Christmas shopping. Winning this would mean a great deal to our family. I would LOVE to win this for my 5 year old. He always gets his feelings hurt when his 2 older brothers have their noses in the DSs and won’t let him play! And he would love having such a cool learning toy! I would love to win this for my daughter. I don’t have very much money for christmas this year, it would really help. I would love to win this for my kids. It would make an awesome Christmas gift. I would love to win this for my 5 year old granddaughter, she would love it. Would love to win the Leapster Explorer! My husband and I were just talking about buying one for our youngest! I would love to win this for my Christmas Eve baby as a birthday gift….she would love it! I would love to win this for my son. He is such a little sponge right now and Leapfrog products teach him so much! I really want to win one of these Explorer’s I have twins and winning one would help with xmas costs alot. i also am subscribed to your feed and e-mail. I love Leapfrog toys! My kids enjoy them so much and I love that they are so educational and fun at the same time. My daughter would love this Explorer! I am a follower on FB. Thanks for the giveaway. I follow you and Leapfrog on FB! I would love to give this to my 4 year-old god daughter. She owuld love it! Our Christmas budget isn’t large enough to buy one of these for our 4 year old – unless that was the only present she got, and she would not be happy about that. So winning one is about the only way she’ll get one for Christmas. I would love to win one of these for my kids. My son has a Nintendo DS like his older brother but gets extremely frustrated with it and hates to play it. I think this would be more his age and he would have more fun with it. And my younger daughter would love to play it too. I’m a subscriber to your emails and your Facebook feed. And I subscribe via Google Reader. Thanks for all the helpful deals and coupon matchups! shared with my friends on Facebook!!! with four kids 12 and under we have been family fans of leapfrog products for a long time. We would love to learn from the newest leapfrog product. Thanks for the chance. I would love to win this for my son! He is 5 and in Kindergarten and just learning how to read! This would be perfect for him!! Why do I want to win an Explorer? Because I’d like a turn on my laptop occasionally! With three kids who are “into” educational games, something of their own would be wonderful. I want to win this to give to my kids for Christmas!! i am also a subscriber to your email newsletter! I would like to win for my almost 3 year old. would be such a blessing to give to my special needs 3 year old! I want to win this for my 4 year old son, he’d love it! I am a subscriber to your feed. Thanks! My 3 year old son would absolutely love this!!! I have also shared the link to your site on my facebook!! I would lov eto win this for my two nephews. They are all over any educational toy I buy them. My daughter would love a leapster this year!! I would love to win this for my niece. She is 3 1/2 years old and whenever she comes to my home, she cannot rip herself away from my 4 year old sons Leapster. She LOVES IT! It would be a great gift to her! I have a 5 year old son that would LOVE this leapFrog explorer! We are tight on money this year so we are loving reading your blog and trying to find ways to save! Leap Frog is an awesome company with great fun and educational games!! LOVE THIS! My 5 yr old loves his leapster and plays it often. We are getting my almost 9 yr old a DS for Christmas and just dont feel my 5 yr old is ready for a DS yes. The explorer looks awesome and I think will be balance out not getting him a DS too. 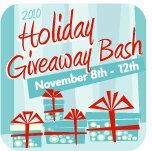 I like you on facebook and I promoted the holiday bash! Would love to win this for my 4 & 8 year old! Looks like a great new learning tool! i have a preschooler who would LOVE this for Christmas! My son would love this! He loves electronic toys. I like you on facebook, and I would love to win this for my 2 sons. We would love to win one of these for our daughter. She loves her My Pal Violet we got her for her first birthday. Thanks for the chance. I would love to win this for my son! I was looking at these online last night! I would love to win this for my 5 year old daughter. She plays on her big brother’s old Leapster, but she would love to have a new one of her own! I shared with all my friends on FACEBOOK. I already LIKED ya! I would love to win this and give it to one of my best friend’s kids. She has 9 kids and 4 of them are between the ages of 4-9, so they would love this for Christmas. i would love to win this for my son.he is 3 and has some learning disabilities.i think this would be a great tool to have at home for some extra learning time. I am a fan of Leapster on FB. Mission accomplished. I am a subscriber. Thank you! I subscribe via e-mail newsletter too. P.S. I know you don’t like to share a lot online, but I hope you and your youngest are doing well! I want to win a Leapster for my daughter who started kindergarten this year. I would love to win this for my 4 year old daughter for Christmas! We love all the leapfrop products! Christmas is going to be tight this year and would make a great gift for my son. Our family are trying to find families in need this Christmas and this would be a great giveaway for a needy family. I would love this gift pack for my 5 year old. He has a developmental delay, especially with fine motor skills. He needs to practice writing his letters so he’ll be able to do his work at school faster and keep up with the rest of the class. Games seem to make him want to do things like this, whereas he won’t just practice writing them on paper for me. Plus, I’m sure he’d love the games, as well. I want to win to help out with Christmas. We have huge medical bills so I wasn’t really planning on buying gifts this year. I would love to win this for my daughter because it is a very educational toy. Wow a great learning tool and a game all in one! This would be great for one, or all 3, of our sons! AWSOME PRIZE!! I really would like to win this my kids would love it.. I would love to win this for my daughter, she has a birthday this month and then Christmas around the corner. I love the age appropriate games and learning activities. I would love to win this for my 4 year old son because he loves a touch screen mode and he needs something to keep him entertained for hours! I am glad I found your site. I have been enjoying all the info. Thank you! I sooooo badly want one of these for my son but I can’t afford it. My son loves the leapster, it is a huge hit at our house. Thanks to stretchingabuckblog for the free collages at Walgreens, they will be great gifts at the holidays. Follow on face book. My son would love it! i want to win this for my son who has been asking for his own game to play like the big kids! I want to win this for my 3 year old daughter! i would love to win the leapfrog explorer for my 5 yr old that is the only thing he has said he really wants for Christmas. Fan of stretching a buck on FB. I’d love to win this for my daughter because it’s fun and educational! Thanks so much for offering this contest! Money is tight and as a mother of 2 you want to be able to get your kids the things they would love to have for Christmas! My son would go nuts over this!!! Promoted this giveaway on facebook! Thanks! We don’t have a Leapster….I would love to win this for my kids. I would love to win this for my 4 year old for Christmas. My daughter doesn’t have a hand held game and I think she would love learning on a leapster explorer! I would love to win it for my 5 year old daughter who has Autism. She really struggles with reading and with learning in general as she has a very hard time in maintaining intrest even for short periods of time. This would help her so much because she loves computers and interactive learning systems and if loves Dora and Toy Story. This would be awsome for her! I would love to win a Leapfrog for my daughter. She loves to use her cousin’s and I feel she would learn so much from it. If I gave her a leapster, I think it would make her year and MINE too! If I won this I would give it to my niece as a Christmas gift! I would love to win one of these for my daughter…she would love it! I am also sharing this on FB right now . Count me in for 2. Money if tight for us, as it is for everyone this year! It would really help to win this for my 5 yr old, so she can feel like she can play video games just like her big brother! Leapster products are awesome!! I have a 6yr who is struggling with reading as did his sister!! Unfortunately, his sister is 17 & we didnt save any of her tools for learning, and i’m sure they would be outdated anyway! This would be a very valuable tool for him to enhance his reading skills!! hello. my grandson was born as a premie at 25 weeks weigh 1lb and has a speech issues and some other issues he would love to have this as a christmas gift. and i think it would help him alot. with his learning issues .thanks so much. I would like to win one of these because they are a great educational learning and fun activity for children. My daughter loves any of the leap products. She is always wanting to learn and this is a great way for her to play and learn at the same time. Thanks!! I would love this for my 4yo! She is at just the right age to really enjoy the games, especially the letter-writing practice. I would love to win one for my daughters! It’s something they could play with together! And I just subscribed to the e-mail newsletter! I would love to win this for my 5 year old daughter. This would be her first electronic game and their products are always good quality and educational. I would love to win one for my son who loved educational games. i would love to win one of these for my 3 year old son. He loves the tag reader Jr. I am sure he would love the new leapster explorer. Thanks for the giveaway. We are on a tight budget for Christmas this year, so this would make a great gift for my daughter! Cool giveaway! My son would love this Christmas. I left a link on Facebook for all of my friends to see! I would love to win this for my son Ethan, who is 3. He loves playing games on his GrandBarbie’s iphone, so I know he will love the touchscreen! If I win, I would love to use it in my Kindergarten classroom. Most of the kiddos can’t afford stuff like this so it would make a new fun way of learning! I would love to win this I have four kids and I have on the way due in march 2011 so I know that is will putt it to good use and my kids would love it . I am also think that it is very educational and fun so my kids would have fun and learn at the same time! Thanks again and I hopw I win! I would love to have it for my granddaughter. I feel it would be a fun learning tool! I would love for my daughter to receive this as a gift this Chrismas! Thanks! I have a 3 and a 5 year old who would love this! I would love to win this for my kids ages 3 and 5! We have always loved Leapster products in our household and this one is just great!! My kids could play “video games” like there daddy and be learning at the same time! I just subscribed to you on my yahoo! Good luck everyone!! I want to win this for my daughter who is struggling with reading and math and they dont have tutoring at her school. We work very hard at night but I think something like this would make it so much funner and Im not the greatest teacher. Thanks for awesome giveaway. I would love to win this! I have a 3 year old daughter and it would make a great Christmas present for her! I would love this for my 2 youngest girls. I need to win cause I have young kids who could use some education!! If I won I would give it to my son for his Christmas gift! He is 3 years old and would love it! I am a single mother of 3 and would love to win this educational toy for my childre… This year has been very tough financially for my family I have been off work a lot due to spinal problem. So this christmas I’m not going to be able to afford hardly anything so winning a few gifts would help out so much. Thank you!!! I always hear such positive comments when it comes to Leapster products. My nephew enjoys learning new things and I think this would make a great Christmas gift for him. If I won this giveaway I would use to for a Christmas present for my nephew. He would love it and I would be his favorite uncle! I would love to win on of these for my daughter. She has been asking for one and she has on on her list to Santa. I would love this for my nephew for Christmas! I follow you in FB and posted about the giveaway. I follow you on Twitter and retweeted. I follow you in a Yahoo RSS reader. I would love to give this to my daughter for Christmas. I really like the e-reader feature! I also love LeapFrog products and would love to win a Leapster Explorer for my 5 year old since it is so educational! This is what I am planning to buy my son for Christmas, so I would be thrilled to win it. This would make an amazing Christmas present!! Education and fun – perfect! I just tweeted about this! I updated my FB status about this giveaway. I would love to win this for my daughter for Christmas. I would love to win this for my 4 year old twins! They have the original leapsters but this looks much more exciting! This would be perfect for my 4 year old daughter. She’s become very active now that her big sister is gone all day to school. We are always looking for new learning activities to keep us busy. I would love to win a Leapfrog Explorer! I know that at least two of my kids would love it! This would be a great educational gift for my son! Would love to give this to my 4yr old daughter! I want to win because my grandson will think I’m the coolest Grandma ever! I would love to win this for my lil man for xmas this year! would give it to my daughter for christmas. This would be a great educational gift for my son to have for many years to come. Both my kids (5) and (almost 3) would love this!! I want to win because i have two young boys and i think this would be a great learning system! I would love to win this for my 3 year old grandson! I would love to win this for my daughter–she is really getting into the leapfrog products! This would make an awesome Christmas gift for my daughter. It would make our holiday travel time pass quickly! My friends always take their leapsters with them in the car. I’d love to win this for my 5 year old! I would love to win this for my son’s Christmas! My son would love to get this for Christmas! I would love to put this under the Christmas tree this year! I would like to win this for my 2 daughters who are under the age of 5. They would love love love it and I love that it is educational! Posted and liked on facebook! I have already subscribed to receiving updates to my email!! I love getting your email newsletter. I, @blessed1indeed, follow you on twitter and retweeted! I would love to win this fir my son because I love buying him educational toys! This would be awesome for my 4 year old. I love it because it will grow with my child. I love Leapfrog products. Any way to get my 5 year old interested in reading while having fun! I have a young son who would love this and it would make a great Christmas present. i have been going back and forth between this and a nintendo ds so this would be great. I like you on facebook and shared this giveaway with my friends! I posted a comment on facebook about winning this prize! My youngest could really use something like this! I love Leapfrog products. I love that they are educational and still lots of fun! Any way to get my 5 year old interested in reading. . I would love to win this to give to my niece. I would love this for my four year old. It will be great for long car rides and it is more educational than a movie! I def. want to win one of these for my DS.It seems like a very versatile learning tool. :) Good luck to us all and than you for the opportunity. I also follow you on fb and have posted about the giveaway. We would love to win this for our 6yo daughter who has auditory processing disorder and learns best with educational computer games. Thanks for the opportunity! I became a fan of your page and Leapster on Facebook!! OHh my almost 4 year old would love this for christmas or his birthday!!! we Love Leap frog!! I also subscribed to your email updates and already like you on facebook! I would love to win this for my son. Leapfrog toys make learning fun. I know he would love this package. He could spend hours playing/learning. I would give this to my 3 year old…I love that it has a touch screen! my son just put this on his Christmas list! I would love to win this for my son who is 4 and has been begging for one, but it’s simply not in our budget at the moment. Thanks so much for the giveaway!!! I would love to win this for my son. He has the litte leaps and now i am trying to find something more challenging. This would be the best gift to donate to less fortunate kids. This is on the wish list of both boys I have. What a great giveaway. I would love to win this for my daughter’s Christmas present. I want to win one of these as a Christmas gift for my daughter! I really want to win this for my son. He hates to sit and learn anything, especially letters and writing. I think he’d really benefit from this. I love anything LeapFrog and my 5 yr old daughter would love this item and get so much use out of it. Thanks. Just shared it on Tweeter. I subscribe. Thanks for all you do! Ok so I’m just going to be honest, I want a Leapfrog learning system to occupy my child while I am doing all my couponing! I do not want to do a portable DVD player and just have him glued to the TV the whole time I wanted it to be a time for him to be having fun but also Learning!!!! I would love to win one because just one leapster 2 doesn’t cut it for 3 young kids…they are constantly fighting over the leapfrog products….leapster 2 and the tag. Thanks for the chance to win! I would love to win this. It’s what I want to get my daughter for Christmas. My three boys, 3, 3, and 19 mo, have not yet ventured into the world of Leapsters. This would be a GREAT way to start! My nephew would love this for Christmas! My 4 year old has this on his Xmas list so this would be perfect!! I subscribe through email. Kids would love this! My boys love leap frog items and this would be a great game to add to their collection! My seven-year-old would love this. Her teenage sister is always getting the expensive “good stuff” like cell phones and a DS. I would love to win this. My daughter is in Kindergarden, my done in 2nd grade. My son has ADHD, anxiety disorder and oppositional defient disorder. He does well in school, but I know he can do better. It is hard to get him to do extra work at the end of the day. This would make it much more fun for him to brush up his skills. I would love to get one for both of my kids, but can’t afford two, my income is limited due to health complications. To win this would make my year, it has been a hard one. I have been waiting for the best sale on Leapfrog-the kids would love this. Would make a great Christmas present! My 5 yr old loves video games and I would love if the ones he played were more educational. I would love this prize package because we love Leapfrog plus money is tight this year for Christmas. I would love to give this to my almost 3yr old for Christmas. I love the leapfrog products and quality. A perfect hand held to grow with her…..
I’m already a subscriber to your email and love it! I would love to win a Leapfrog Leapster Explorer for my son! I’d give this to my son. I love that its an EDUCATIONAL toy! I am a facebook fan and I posted about this giveaway. Two of my boys are asking for them for Christmas, so this would be such a blessing to win and save us money! My almost 4 year old would love this! Thanks for the awesome give-a-way! We don’t have any game system and she’s always fighting to play with Daddy’s iTouch. I would love to win this toy for my almost 4 year old. She is definitely into writing letters, and I think this would be a fun way to help her practice without always using pencil and paper. and i am a facebook fan! I’d love to win this to for my kindergartner son. Thanks! I’d love to win this for my daughter for Christmas! She’s 7 and would just LOVE it! i would love to try out the leapfog line of products…i know my daughter and i would love them! this is on my christmas list for my son, would be such a blessing to win. I know my daughters would love one of these. Right now they have the leapster 2. I was already debating what to get them and love the education side of leapster with the fun built in. I want to win this because 1) it is an AWESOME product, and 2) it would make a sweet gift for my daughter! I would love to have one for my daughter. My son has a vtech and sometimes it works and sometimes it doesn’t. I would love to win this for my daughter’s upcoming birthday! She loves Leapfrog products and I love that she learns and has fun all at the same time! liked you and promoted the giveaway on facebook! I’d love to win one, so I can get my phone back. Currently my daughter plays games on my iphone while we’re out, or just anytime she can get her hands on it (I often have to hide my phone). This would be great for us both, and educational. yay! This would be a great gift for my 6 year old granddaughter. She is having a hard time at school learning and this would give her a fun way to learn. Thanks for the chance to win. Hi! I would love to win a Leapster Leapfrog Explorer for my boys age 3 and 5 years! It would be a great educational toy to have fun with and grow with! I want to win this for my nephew! Would love to win this, my son would really enjoy it. He’s been eying it at the store more months. My almost 3 year old would love to keep up with his older sisters who already have the older version of the Leapster. They love theirs! would love this for my 3 year old! i would appreciate winning this for my granddaughter. her mom is a single mom anddoesn’t have a lot of cash to make a fabuous christmas for her daughter. thank you! I would live to win a leapster because it is a fun yet educational toy that I think my three year old twins will love! Would love to give this to my son. I am a facebook fan! I would love to have one of these under the Christmas tree for my son!!! I love Leapfrog products. I was hoping to get my son the Leapfrog Explorer for Christmas. I would love to win it from your giveaway! Would like to win these for christmas gifts for my nephews. I follow you on facebook and will be promoting your giveaway as soon as I send this comment!! I subscribe to your feeds. Would love to win! I would love to win this for my 3 kids (5 and under)!!! This would make a great Christmas present! I would love to win this because I love the educational value of this toy! My twins already have this on their list for Santa! They would love to win one! Following you on Facebook! And I shared the link! I would love to win this for my daughter, and she will enjoy it so much with different learning games! Would love to give this to my daughter as she has been asking for a “computer” since she was only 3. I would love to win one for my daughter to use on road trips. Subscribed to your newsletter via email. This would be a great gift from Santa to our son. Like so many people, we are very strapped for money and this would really help in the Santa dept. Also shared the giveaway on my facebook page. This would be a great learning tool for my son who is a fan of Leapfrog toys! I want to win this prize because it is a fun and educational system for my son to learn and enjoy. Would love to win this for my little girl. Perfect for Christmas!! My daughter really wants an explorer for Christmas! I’m following you on twitter and tweeted this giveaway. I share on my facebook. I would love to be able to win this for my 3 year old daughter. She commutes into Atlanta with me every day so she can go to school close to my office and it would be a great learning tool for her to use on the drive. This would be a great giveaway to win! My 5 year old daughter would absolutely love this gaming system! Thanks for the great giveaway! This would be the perfect stocking gift for my little girl. I want to win this for my 4 yr. old daughter! My four year old son would love one to take with him to my foster son’s many doctor appointments and therapy sessions. He is really pretty patient but this would save us a lot of stress. I follow you on Facebook and would love to have this for my Grandson. He loves educational games and this would be such a great thing he could take with him . Thank You for giving us the opportunity to possibly win this! I am a fan of you on fb and aleady a fan of leapster. I put the giveaway on my fb status. We want to win the LeapFrog Explorer. i am now following you and tweeted message on twitter! My 4 year old would love this! We have ben wanting one, but don’t think we can afford it this year. I am a subscriber of yours. I tweeted on twitter about this giveaway. I would love this for my daughter. We travel a lot and this would be great for her on our long trips. I posted this giveaway on my FB page. My 4 year old son is into gadgets (phones, cameras, etc). He would so enjoy this. My daughter just started kindergarten and would love that for Christmas. We are great fans of Leap Frog toys. My five year old grandaughter would love this for Christmas. Thanks! i WOULD LOVE ONE OF THESE FOR MY SON BECAUSE WE DRIVE FROM WA TO CA A COUPLE TIMES A YEAR AND IT WOULD BE PERFECT TO ENTERTAIN HIM DURING THE 21 HOUR DRIVE! Thought it would be a great gift for my children, but then they have enough stuff. I would have my 4 year old wrap it and give it to one of the many military children here in town. Their parents struggle daily to make ends meet while sacrificing everything for us. I would love to win one of these because I’ve been wanting one for my daugter but I just can’t afford it at the moment-thanks for the great opportunity!!!! I would love to win this for my girls, they love the Leapster toys and after seeing the features on the newest item in the LOVED Leapster collection I as their mom am excited as well!! My two daughters have enjoyed their larger book type LeapFrog very much. It was very helpful in teaching them to read. This newer smaller version would be very nice. I would love to win this because we travel to Utah a lot. It would help keep my daughter entertained! This would be a Christmas gift for my two girls (ages 7 and 5). This year Christmas will be quite small due to a new job for my husband so this would be an awesome addition for our gifts. I would love this for my 4 year old! I love toys that provide some educational value as well as being fun! My 4 yo would enjoy seeing this under the tree! I also subscribe to your blog via email! My 5yr old son would love this!! My son loves any sort of video games. I know he would absolutely love this. And great for the long rides to Grandma and Grandpa’s house. I’d love to win one for my nephew….he’d love this! I would love for my son to be able to learn while on the go – especially for long trips. My daughter wants a Leapster for Christmas. Simply put, I want to win this because this is what my daughter wants for Christmas. I would love to win this because it would be a great gift for my children for christmas. I would love to win this to give as a gift to my children! They would love upgraded systems! I am an email subscriber! Thanks for the opportunity! This would really make my family happy this Christmas!!!! We love love love leapfrog. My 3 year old son is ready for one and it is on his christmas list. Thanks for the blog and giveaways…. We would love to have the new Leapster because you can use it to take pictures. We have the Leapster 2 and LOVE it…and would gift it to someone if we win the Explorer! This is one of our potential Christmas list items for our 5 yr old daughter. Would be great to win it for her as she has been asking for one. Thanks! It would be a great blessing to my family if I were to win. We have 12 kids and trying to make everyone’s Christmas special is important to me. My youngest son, William, would love this for Christmas. My son, Levi, has already asked for one of these for Christmas. It would be a great toy for us to have – we have 5 boys! My four year old would absolutely love something electronical for himself. This would give me the chance to give him this. I would love to win a LeapFrog Leapster Explorer for my daughter! I would love to win because I think my kids would love to play with it. i subscribe to you . I want to win this so bad because I absolutely love Leapster products. I have a 6 year old that was diagnosed at age 3 with a developmental delay and ADHD. It was impossible to teach him with books and worksheets, so we bought several Leapster products and “tricked” him into learning. He is now a straight A student and in the top reading group in his class. Leapster products are awesome and we love having them in the house! I would love to surprise someone at Christmas with this!! This is one of the things on my list for our 5 year old. It would be great to win it! Thanks! I want to win this for my daughter…it is on her list already!!! Subscriber to the rss feed. I would love to win this for my four year old!! I would love to win this for my daughter. She would love to have this for Christmas! I would love to win this for my son because it is a learning toy that he can have fun learning while playing! I would love to win this for my four year old. It’s perfect for him. Would love to win this for our daughter. She loves educational games. I would love one as with three kids and one military salary we live on coupons and giveaways! I would love to win this for my almost 3 year old. He loves his tag junior so I think we love this new leapster as well!! my kids would love this for long car rides! i love that it’s portable!! My daughter would love this for Christmas – she is currently using her brother’s old leapster, and would like a new one that is hers with some new games! I would love to win this for our neighbor’s son, who really wants one and we are trying to help them for Christmas! My four year old son would love this! I would love to win this to give to my daughter! This would a be an awesome toy for my little one. My daughter has the Leapster 2 she received at Christmas last year, and her little brother is always stealing it now. We need the new Leapster Explorer to return peace to our household. I would love to win this for my kids for christmas!! “Liked” your page on FB. Tweeted! And subscribed to email newsletter. Thanks! I have 4 kids and three of them could benefit from this educational toy. this would go to my little girl for christmas! My son would love this so much!! It would be a great Christmas present! My kids are too old for this but I would love to win it for my nephew. We LOVE leapfrog!!! So educational AND fun! I just became a fan of stretching on facebook! I would love to win the Leapster Explorer giveaway b/c it is already in my plans to get this or something similar for my youngest (almost 3) for Christmas!! What a great thing it would be to win it!! I want one for my daughter…she will LOVE it!! I posted about the giveaway on my FB page! i was eyeing these for my kiddos! I’d like to win this for my little boy for Christmas. All 3 of my children love Leap Frog and I love them because they are educational but still fun. I would love to win one, as Santa is thinking of getting this for my son this year. I want to win one for my sweet daughter who is 4 1/2 years old. She loves games and would have so much fun! I want to win one for my daughter! She is struggling with her reading and this could help!! Leapfrog are the only techno gadgets I buy for my kids because of how they teach as well as entertain. Would LOVE to win this for my daughter for Christmas!! I also follow you on FB. I would give it to my niece, she would love it. This would be a fantastic gift for my Preschool aged son…I’m always looking for new ways to offer him a chance to learn more and better himself! I think this is a fabulous learning tool, and would be great for my daughter! I shared on facebook about the giveaway. I would love to give this to my 4 year old – she is struggling with preschool and I’m trying to make learning fun! Would love to win this for my daughter for Christmas. My little boy would be in heaven with one! I would love to make my 5 year old’s dreams come true by giving him this for Christmas. I’m sure all 4 of my kids will love it! My kids would love it and it would be great to have them play while I was setting up for my MOPS group! I want to win for my grandsin because I love leapster products. Very educational! Thanks. My daughter would LOVE this for our 10 hour trips from SC to MD! Subscribing via my yahoo reader! My son would love this! Pick Me please! Thanks! My 2+ yr old son loves letters and numbers and always want to play games on my cellphone so this would be an amazing gift for him. I would love to win this because I love everything leapfrog. I would love for my daughter to have the newest invention by them. I would love to get my son started on leapster products. We love Leapster and my son would love this! Thank you for this opportunity! I have 2 yr old twins that would LOVE this! This would be educational and FUN! Everyone wins with this gift;) Thank you! I’d like to give this to my nephew! Would love give this to my dh to help her learn. I would love to win this for my oldest son! Like you said I think it’s something that would grow with him for years and the educational aspect is a great mommy bonus! I would love to win this for my son! He is only four months old right now, so we would be sharing it with my two year old nephew! want to win for my daughter and to help out our budget! liked on FB and shared! It will be going to my 3 y/o. That is the only thing on her list. I have two little girls who would love this! My 6 year old would love this. She has a tag and wants the leapster for Christmas. I would love to win this for my 5 year old son, I think he would love it! I would love to have this for my daughter. I love that I can monitor her progress. I can’t believe it!! This is what I wanted to get my daughter for Christmas, but didn’t how I was going to be able to afford it. She’s loves learning new things. i would love to win for my two grandsons – they are both the perfect age for this. I would love this for my son’s Christmas! This is so exciting! My son would love this! My step-daughter is a litle behind developmentally, and we would love to give her something fun but educational for Christmas! Thank you for the chance to win! Love Leap Frog products. My oldest son is 12 and we have been using Leap Frog products since he was little. Since I still have a 4 year old and one on the way we would love to try this new game! My 2.5 yr old is totally into educational games and would LOVE this! I would like to use this to help occupy my younger twin daughters to my older son’s VERY long swim meets. I like how it is educational too. I would love to win this for my 4 year old son. He would love this for Christmas! I was thinking about buying this for my four year old for Christmas! My 3 year old would love to get this for Christmas! I would give this to my 3 year old son. i want to win it because my daughters old one just went kaput! I would love to win this for my children because I love the Leapster products. They are fun and the kids have no idea that they are learning the whole time they are playing. I would love to win one for my 4 year old. She really wants one! I already subscribe! I hope I win, my daughter will be so excited. Oh I want to win! My daughter would love one! I Would give it to my son jake he would love it for christmas its on his list !! I have three kids 5, 4, 19 months and one due in December so I know they would love something like this to play with. It would be put to use for sure. Thanks. i joined your email newletter !! I was just looking at an Explorer for my 4 year old. I think he would love the games and and I love that it is educational and especially the ability to do ebooks!! This would make my babies feel like they are playing like the big boys! They would love it! Would love to win this for my little guy! I was hoping to get two of these for my two youngest girls this Christmas, they always want to play their older sisters Nintendo DS. This would make an excellent birthday gift for my alost 6yo son! I would love to win this because my daughter would love it and I love Leapfrog toys! I would love to win this for my little sister. She really struggles with reading and I think this would be a fun way to help her learn! This would be great for our homeschool! I like you and leapfrog on facebook! I would love to win this for my 2 & 4 yr. old boys! I want to give this to my son for Christmas. i follow on twitter and tweeted about this giveaway! This was already on our list for our 4 year old this year. Would love to win it! I sub. to your RSS feed via Google reader. I would love to have another tool to help my son and daughter learn to read my goal is to have them both reading at 4. Would love to win this for my 4 yr old daughter… Love new ways to have her “learning” at home at get her ready for kindergarten!!! I love that it has a left hand function for my leftie! I want to win so I can give this as a Christmas gift to my sweet little 4 year old girl! Great gift for my niece…learning while she is playing! Would love to win this for my 4 year old! She’d have a blast with it! I would LOVE to win this! My husband and I are trying to save up to buy two of these for our twins. I would love to win this for my daughter who turns 4 on Xmas Eve. Money is very tight and this time of year really kills us with both her birthday and Xmas a day apart! I would love to have this as a learning tool for my daughter. We have 3 kids (right now) that I’m homeschooling. My 5-year-old twins would love to fight over this! This would be a great Christmas present for my grandkids who are homeschooled. We love the Leap Frog items. I would love to win this for my son for Christmas! Thanks for the chance to win! I now subscribe to email. I would love to win this for my 6 year old daughter. It would make an awesome Christmas present! I would be giving this to my 5 year old son. We love Leap Frog toys and this looks like another great product from them. I would love to win this for my 4 year old! He was playing with this at Target the other day and loved the games! This would be an amazing educational and fun gift for my grandson.Thanks for the opportunity to win. I’m a Google subscriber through your feed. I would love to win this for my son. I love the educational elements of leapfrog products. This would make a terrific gift for a darling 4 year old on my list. Hi – we are the rare “no technology family” ;) Oh we had the Leapfrog baby & toddler toys but my kids have never had a Leapfrog handheld nor anything similar. We have no Wii, no gaming consoles, no gameboy, no high def tv, etc. Now this year we bought our first EVER tech toy for oldest son – a refurbished DS with educational games. he loves it (& it’s a good tool for discipline – great currency). We would love to buy a Leapfrog for youngest son’s birthday (right after christmas) but honestly money is very tight (as I know it is for many people) and I don’t know if we can swing it. It’s certainly an affordable item as far as tech gadgets go but once you add the games, case, etc. it’s still a chunk. I would so appreciate the help and love to win one! My almost 4-year-old has been wanting an Explorer since she saw it on TV, She also has been asking for a camera, so this will be perfect! Because it would be the perfect gift for my young nephew. I would love to win this for my 3 year old daughter. She is so smart and there is so much that I would love to do for her. Bringing this home would be an amazing treat! I would love to win one because my younger son got one for his birthday but I think my older son could learn a lot from it too and they are not so good at sharing sometimes. I would love to win this for my daughter. She would have a great time learning with this. I want one because I think my son would love it! I think it’s awesome that you can download games from the internet! I would love to win this for my preschooler! He loves learning and this would help foster that! I would love to give this to my boys for Christmas. I followed you on fb. I would give it to my so who has just learned how to read. What a great christmas gift for my son! I have 2 children that would be able to use this for many years. I follow you on facebook and with email. Thanks!!! I would so much love to give this to my daughter! I would love to win a Leap Frog Explorer to give to my son, because I know he would love it! I want to win this for my friend’s daughter. I liked this on FB. I want to win this because the toy is both fun and educational, you can always rely on Leapfrog! My six year old granddaughter is wanting one for Christmas. I would love to win this giveaway for my six year old who has the outdated Leapster and loves it! Please enter me to win. Thanks! I also subscribe and follow you on FB. Please enter me to win the giveaway for the Leap Frog Leapster Explorer Prize pack. I would love to win this because I have three boys ages 4 and under, and we homeschool. This would be a wonderful asset to our family! My 7 year old son would love this. He sees all the kids with the DS and I just can not do it. I see other kids almost like they are addicted to them and from what I see they have zero educational benefit. I love Leapfrog products and would gladly give this to my son. This would be perfect for my daughter!!! I’m sad that my 8 year old is outgrowing her Leapster. If she didn’t want it, I’d gift it to someone. I would love to win one because my daughter definitely learns well through games and interactive technology like this – and I don’t really ever feel I can justify the expense! I really want to win this so that I can give it to my daughter for Christmas. She loves her Leapster 2 and I think she would really love the Explorer as well. I would love to win this for my son. I follow you in reader. I would love to have this for my son. He would really appreciate having this game system. my twins are getting old enough to try the leapsters now and my oldest has worn are L2 out! I would love to win this for my daughter! We have not been able to afford one, so I let her play it every time we go to Target. It would be so nice for her to have one. I posted about this giveaway on Facebook! I would love to win one for my three kiddos. I would love to win and give it to my niece for Christmas. I subscribe to the blog via email. I want to win one because other leapfrog products that my daughter has have been so good for her-she knew all her letters by 18months! Now that she is older she is outgrowing the ones she has. I suscribe-thanks for the chance to win! This is on the top of my five year olds Christmas list! I have 3 little girls and would love to have this educational toy for them. Thanks for the opportunity to enter! I would love to win this for my son could replace his love for Dad’s iphone with a new Leapster! My 6 year old daughter would LOVE this. She’s been playing with them in the store and would really enjoy having it. Thank! The perfect “toy” to occupy our grandchild on the 10 hour trip to see us! I have a 3 yr old who would love this! I want to win this to give to my 3 year old daughter so she has something fun and educational to do on our long car rides to visit family! I would love to win this and give to my son for Christmas. I’d love to win this to gift to my daughter on her birthday. I would love to win this for my 6 yr old son whose leapster is worn out. I love leapfrog products, and my son is into video games big-time. I would love to win this and have him do more learning than just gaming! My 3 grand kids would get a lot of mileage out of this. My kids love the tag reader and also playing games on my phone. So, having their own educational gaming device would be great!! I would love to win this so I can finally cross something off my list. I use Leapster products in my classroom for my Kindergarten students and would love to have one at home for my four year old daughter! They are great learning tools. I would love to win this for my son. Learning plus hand-held game = win, win. Two of our kids have asked for Leapsters for Christmas this year. We are trying so hard to stick to a tight budget and become debt free that we were not planning on spending too much on Christmas this year. But at the same time we want to be able to make Christmas special for the kids. Winning one of these would be a blessing! I would love to win this for my daughter. She is already proficient on the Itouch but is getting bored with the games…plus she has to share it with her older brother. This would be something that she could have as her own. Not to mention she would be learning in the process. It’s a win win . Thanks for the chance. I am a feed subscriber…google reader. My daughter would love this! It would be perfect for her! My son would love to have this. He loves leapster. I would love for my 4 year old to have his own hand held learning system. i have heard so many good things about Leapster! I follow on facebook and posted about this giveaway! My son would love this- I am not a video game fan, but I love learning games! Thanks for the giveaway! my 4 year old would love to use this on our many road trips to see grandma. educational, fun and passes the time on those long driiiiives. I have twin boys who are about to turn 5 , and just started preschool. I am also a teacher so I really value educational toys. I would like this for my 5 year old son who is a little bored without his big brother at home during the day! I posted the giveaway on FB! I have a four year old who is just starting to take interest in his older brothers handheld video games. I know he would love one of his own! I would love to win this because my child does not have an educational toy like this and with my family being far away from us it would help him learn and have fun on the long drive to visit them. Love LeapFrog it is such an easy device to learn with, my son loved the first leapster he had so much he has scratched the screen up and in need of a new one. Would love to have this! I would love to win this for my 5 year old daughter. We have the tag pen and she loves it! I would love for my boys to have a fun, educational game. My daughter would be thrilled to get this for Christmas!! Thanks!!! I follow on twitter and I tweeted! http://twitter.com/ROAOM/status/1851379391930368 Thanks!! Just shared on FB, too! I would like to win this prize because my niece’s Leapster quit working and can’t be fixed. I would love to win one for my 4 year old for christmas! I’d love to have this for our holiday travels! I would love to win this for my four year old who is so jealous of all of his older sister’s hand held gaming devices that he is only allowed to look at. This would be educational and entertaining and something I could feel good about letting him play with. I want to win this so I can give it to my daughter for Christmas. She’d love it. I’d love to win. I’ve got 4 kids under 7 years old and I LOVE Leap Frog toys. Thanks! I tweeted about the giveaway. Thanks! I subscribe to your feed on my reader. Thanks! I would love to win this for my almost 5 year old who LOVES leap frog ANYTHING!!! I want to win this because I think my children would love to find it under the tree on Christmas morning. Plus, like you said, it would be great for those long car rides to visit family! And of course….it’s education meets fun! It would be an awesome gift for my BFF’s young sons. I love Leapfrog toys and they help my kids learn while having fun ! I am a Email subscriber ! I would love to win this for my daughter who will be two soon. I want to make sure that I do everything I can to start her off right and this sure will help us out!! I follow on FB and shared!! I would love to win this for my sons. This way my almost 4 year old could have his own and feel like a big boy and learn at the same time. Too expensive to get each there own form Christmas this year. I’d like to win this as a Christmas present for my kids. They’d be so excited! My kids would love to have this toy for Christmas this year…and I would love to win it for them! Thanks for the chance. Honestly, I know my son will love it and we just can’t get him one! I want one of these for my little boys. We have the pen and think that this would be another hit in our house. Would so LOVE to give this to my daughter for the holidays this year! I would like to win so I can give the prize to a woman I work with. She doesn’t have much to give her kids for Christmas because money is tight this year. This would be perfect for her son. I would give this to my son. He had a Leapster LMax that broke. I would love to win this for my son because he deserves it very much!! I follow you on facebook and I promoted the giveaway! Also following you on facebook now. Oh gosh! I would love to win this for my son! I love anything that is educational and fun! We have adopted and foster kids in our home and this would be a great gift for the six year old girl. Thanks! My son is having a hard time in school and I think this would be great help for him. I love Leapster products and would love to have this for my 4 year old son. I would LOVE this system for my autistic 7 yr old son. He is hooked to any form of video game or tv. He zones out on them and I would like to think that he was learning something at the same time. I tweeted the giveaway MrsASimon. My boys would just love to be able to play with this, plus it is educational in the process. Yeah! I have 2 little girls 5 & 3 – this would be a huge hit with them!! I would love to win this for my children since I think they are ready for more advanced electronics but are not quite ready for a DS or PSP. I am a fan on Facebook and I shared the giveaway (Megan Zinser Allan). My 3 year old & day care kids would love this. I would love to win this for my seven-year-old daughter who loves to learn, play video games and read!! This would make an awesome Christmas present for her!! I subscribe to your email!!! This is great for my preschooler! My seven year old daughter would love this! I am an email subscriber. I would love to win this for my 4-year old daughter. We are always on the lookout for alternatives to the nintendo that every kid seems to have. I would rather her learn while having fun. This would be a great teaching tool! I now subscribe via email! I would like to win this so that my girls can move up from Leap Frog baby! This would make a wonderful gift for my son! I would love this for my daughter.. as a teacher i know the importance of making learning engaging for kids and this would do just that! I would love to win this for my son!!! I had plan on buying one, but it would be so much nicer to win it!!! I”m a FB fan and I shared your llink. I would love to get this for my preschooler! I would love to win this for my granddaughter. She will be five next week. I want to win one because it is an educational toy and kids love it. I really want to win this for my daughter Meredith! She would love this, and I think she would learn alot! I think this would be great for my daughter to have for her first airplane ride. I would love to win this because I think it would be a great alternative to a DSi, I’m not sure that I want to get my 3 year old one of those yet. I would like to add this to my preschool classes resources. Our 7 year-old and 5 year-old twins all have Leapsters that have been passed down from their older siblings. The 3 year-old now wants one of her own. It would make those long car trips easier. This would be great to have because kids learn while having fun! I have a 2 year old neice who would really benefit from this! My daughter needs something like this! She is always playing with my husband’s iphone! I would like to win because my kids would love this and they truly enjoy learning! I think this is a great educational tool for the kids. We have 3 kids that would love to share this. I tweeted about this giveaway. I’m not sure how to get the link but my addy is jrosencr. I am wanting to win this for my almost 4 year old son. He wants a handheld game system for Christmas and this would be great for him. I would like to win this to give it to my nephews. I want to win this for my daughter because she sees her brother carry around his DS all the time and she would have something to play with too! I want to make this a great gift for a little one! I have heard great things about the Leapster and would like one for my son’s birthday. My son wants one so badly! I would love to win this to see the smile on my daughter’s face on Christmas morning. The fact that it is an educational toy is a bonus! I would like to win this for my nephew. He likes electronic things, but has problems with his motor skills and the touch screen will be great for him. I’d like to win this because I love every Leapfrog product I own. I’d love this for the reading capabilities. Would love to win this for my 4 year old girl! I would love to win this for my niece. She loves her alphabets and her numbers. I’m sure my three kids would love this. I would like to win the LeapFrog Leapster Explorer so I can give it to our grandson for Christmas! I would love to win this for my son because it is educational. I want to win this so that I can give it to my three year old for Christmas. I would love to win one for my three year old daughter, a great learning tool! This would be great for my tutoring business! Posted a tweet about it!!!! This would be perfect for my 4 yr old! Leapfrog makes the most educational, fun toys out there by far. I would love to win this for my daughter for Christmas thanks for a great giveaway! I want to win so I can give it to my 4 year old for Christmas. He would totally love it, and its more than our entire Christmas budget all together!